Veronica Moffitt is from New Jersey, USA, where she received an Associates Degree in Business Management. She's 22 years old and is currently living in California working as a florist. She always sees the glass half full, and enjoys photography, listening to music, and living near the ocean. She volunteered with Volunteering Solutions in Kathmandu, Nepal. 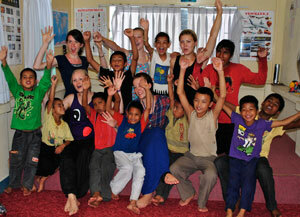 Why did you decide to volunteer abroad with Volunteering Solutions in Nepal? The reason I went to Nepal was because my friend Patrick had signed up for the program and convinced me to join him on the adventure. I had always wanted to do some kind of volunteer work outside of the country, but didn't even know about Nepal until Patrick told me about it. Day to day life was simple, but enjoyable and rewarding. In the morning we would wake up bright and early with the kids and help them with any school work or laundry that needed to be done. Breakfast was around 8 and we all ate together. After breakfast it was time to get ready for school. Five days a week we would go to school with the kids and teach any classes that had an absent teacher. Otherwise we would just walk them to school and then pick them up in the afternoon. When the kids get home from school, the first thing they do is homework. Helping 17 kids that only speak broken English with homework was a challenge, but with the help of a local tutor it usually went pretty smoothly. If there was no homework to be done, we would get to play games like Uno and Carrom Board. The kids also loved to draw and color. We did these types of activities until dinner time around 7 and after dinner we would help clean the dishes. Then it was time for bed. The kids were great about going to sleep for the most part, and the next thing you know they're knocking on your door at 5:30 in the morning ready to do it all over again! What made the trip so special was being able to be so immersed in the culture and getting to live so much like the locals. Advice to other volunteers: go with no expectations. Have an open mind and embrace how different a developing country is compared to what most people are familiar with. One of the best things about this trip was being able to leave Kathmandu Valley to see other unbelievably beautiful places Nepal has to offer. The city is wonderful, but I recommend seeing the jungle or the Tibetan Border if you can make the time. The trip has had a huge impact on my life. I will never forget how humbling the people of Nepal are, and being there can really help you put things into perspective in the future. I know I will be returning, probably more than once. I will never be able to forget the kids, and I plan on staying in touch with them for rest of my life. The time I spent in Nepal has inspired me to want to continue volunteering in other countries as well.